Mediastinoscopy with biopsy is a procedure in which a lighted instrument (mediastinoscope) is inserted in the space in the chest between the lungs (mediastinum). Tissue is taken (biopsy) from any unusual growth or lymph nodes. Mediastinoscopy is a procedure in which a lighted instrument (mediastinoscope) is inserted through a neck incision to visually examine the structures in the top of the chest cavity and take tissue samples. 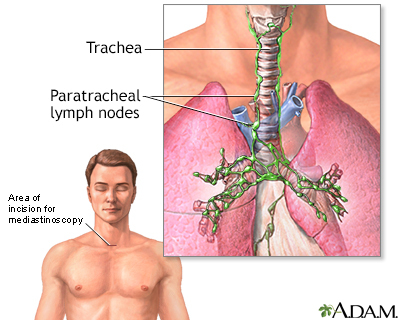 This procedure can be used to biopsy lymph nodes surrounding the airway to help diagnose or see how far a particular disease has spread. A small surgical cut is made just above the breastbone. A device called a mediastinoscope is inserted through this cut and gently passed into the mid-part of the chest. A chest x-ray will often be taken at the end of the procedure. The procedure takes about 60 to 90 minutes. You will be asleep during the procedure. There will be some tenderness at the site of the procedure afterward. You may have a sore throat. Most people can leave the hospital the next morning. In most cases, the result of the biopsy is ready in 5 to 7 days. This procedure is done to look at and then biopsy lymph nodes or any other abnormal growths in the front part of the mediastinum, near your chest wall. This procedure is also done for certain infections (tuberculosis, sarcoidosis) and autoimmune disorders. There is a risk of puncturing the esophagus, trachea, or blood vessels. In some cases, this can lead to bleeding that can be life threatening. To fix the injury, the breastbone would need to be split and the chest opened. Cheng G-S, Varghese TK. Mediastinal tumors and cysts. In: Broaddus VC, Mason RJ, Ernst JD, et al, eds. Murray & Nadel's Textbook of Respiratory Medicine. 6th ed. Philadelphia, PA: Elsevier Saunders; 2016:chap 83. Putnam JB Jr. Lung, chest wall, pleura, and mediastinum. In: Townsend CM Jr, Beauchamp RD, Evers BM, Mattox KL, eds. Sabiston Textbook of Surgery. 20th ed. Philadelphia, PA: Elsevier; 2017:chap 57.